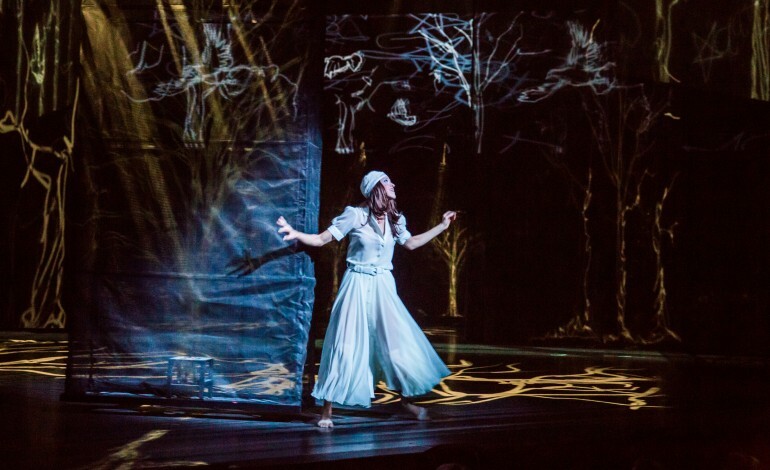 What once started as a humble nouveau cirque (“contemporary circus”) experience has grown into a juggernaut the likes of which stage performances have never reached before. 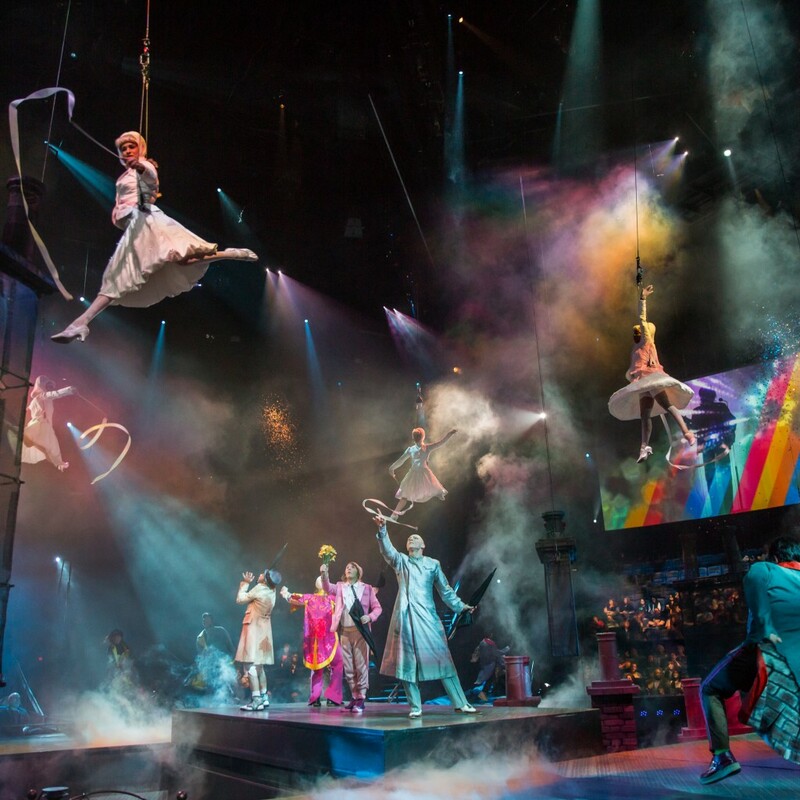 The Canadian-run performance collective Cirque du Soleil have no less than six shows currently running almost daily in Las Vegas alone. 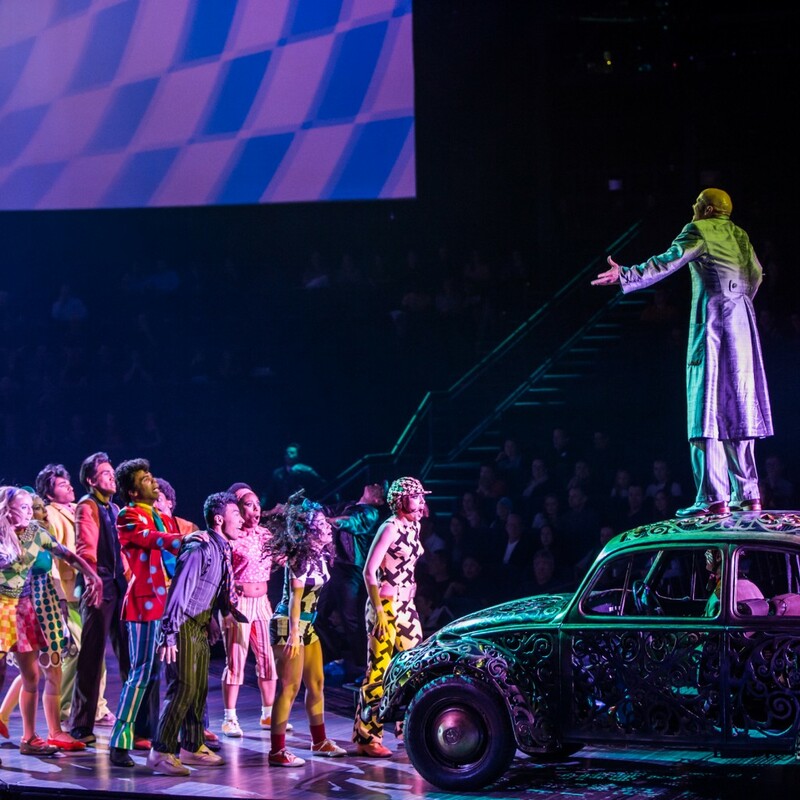 On this particular evening, it’s the now legendary show The Beatles LOVE staged at its own theater at the Mirage that we are fortunate enough to attend. Now in its 11th year, Love has become a show of mythic proportions. The Beatles’ stature as one of the world’s greatest bands ever still not diminishing, in fact, still growing as time marches on due to the ever more obvious impact of their influence, has led to this show being known as one of the only ways to truly hear the full Beatles sound live. Paul McCartney and Ringo Starr may still perform choice cuts from the band’s stellar catalog live, but since John Lennon’s passing in 1980 (and subsequently George Harrison’s passing in 2001) hearing the band in their original four-piece configuration has been impossible. This show has become the closest thing to that original masterpiece of harmony and cohesion that fans can find live. If you’re a serious fan of The Beatles or someone who feels like they lived their life hallmarked by their music, everything you’ve heard is true, make sure you see this one for yourself. It’s not to be missed. Tucked deep inside the cavernous Mirage Casino, the Love Theater is a uniquely designed in-the-round experience. Specifically constructed for this stage show, its vaulted stadium seating allows for an excellent view regardless of the seat. Literally, there isn’t a bad seat in the house, and every position allows for viewing the elaborate performance in a distinct way. 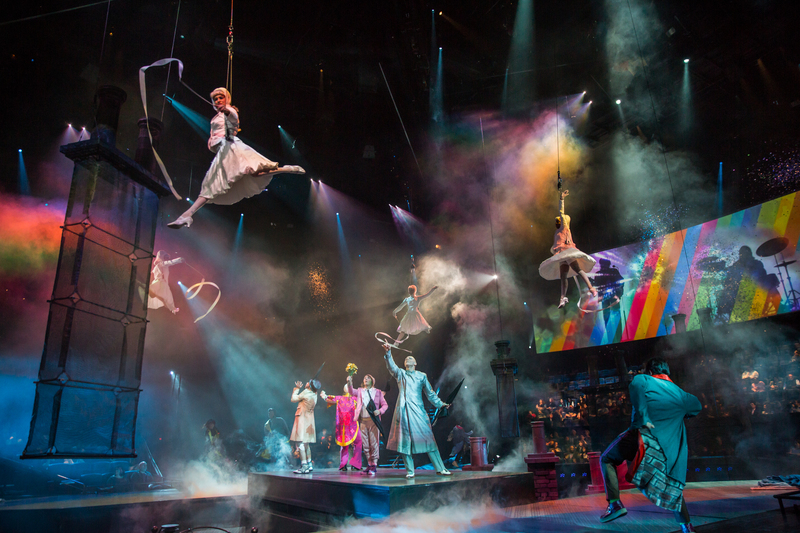 No circus would be complete without a hefty degree of clowning, and this Cirque du Soleil show is no different. While the multitudes found their seats amidst the confusion and horde of ushers, various characters from the show appeared throughout the auditorium and capered for the amusement of the audience. One such character was bald and carried a steaming teapot. The teapot overflowed with some kind of innocuous steam and the clown approached audience members randomly to deposit a small cloud of the harmless stream on their heads. Others at center stage pretended to unsuccessfully fish. The mega pop continued on the legendary cuts “Twist and Shout,” “I Want to Hold Your Hand” and “Drive My Car.” For the latter, a vintage ‘60s Volkswagen Bug was set up with a pair of makeshift halfpipes. For the duration of that number a series of rollerbladers did death-defying jumps in unison. The first larger-than-life cut came in the following segment, the simple, longing and infectious “Something.” For this number, two female dancers/high wire artists elaborately danced with a male dancer. Their movements echoed a man’s pondering between two possible lovers, ultimately missing out on both due to indecision (each of the female dancers flittered away into the sky before the male could claim either as his own). Some of the show’s greatest tricks came in the segments that followed. Shifting into the band’s later career psychedelic leanings, “Strawberry Fields Forever” ushered in a medley of “Within You Without You” and “Tomorrow Never Knows.” During the sequence, a makeshift boat with several performers placed within appeared in the center of the theatre. A flowing curtain started to emerge from beneath them and was extended over the top of the heads of the audience in every direction. The effect underneath was like seeing out amidst a vast ocean, the boat at center stage seen only through a hazy dream. Even better, the angelic opening notes of “Lucy in the Sky with Diamonds” plucked forth as the room turned fully dark. Each successive note was accompanied only by sparse green-colored lights hung from the ceiling. As the song unfurled to its bombastic chorus, a trapeze artist in a glittery diamond-esque costume performed a masterful aerial ballet, interacting sparsely with a fireman in puffy pants who led a wheeled ladder to-and-fro for her to bound and rebound from. The segment for “Octopus’s Garden,” on the other hand, was as colorful and bizarre as the song itself. A menagerie of aquatic creatures frolicked everywhere the eye could behold. “Here Comes the Sun,” “Come Together,” “Revolution” and “Back in the U.S.S.R.” brought the environments and staging back to a serious tone, hinting at the political upheaval and needed progress of the late ‘60s. Perhaps the most impressive segment of the entire piece followed, as a lone dancer controlled the stage for an alternate arrangement of “While My Guitar Gently Weeps.” The dancer twirled and spun incredibly, telling a story of a lost love. Video walls all around the stage reacted in positive and negative space as a luminous stick figure of a man danced just out of reach of the beguiling woman. Underpinned by the song, it’s one of the rare times that modern dance is obviously evocative of profound meaning. Not to be outdone, the show’s final segments aimed for some of the most intricate or successful songs of The Beatles’ catalog. “A Day in the Life,” one of the most elaborate of the band’s concoctions, was the backdrop for another stunning trapeze act. A somewhat shortened version of “Hey Jude” was the much-needed singalong for all of the show’s varied performers as well as the packed house in attendance. It all ended appropriately (and thematically) with “Sgt. Pepper’s Lonely Hearts Club Band (Reprise)” as a simple and elegant farewell. 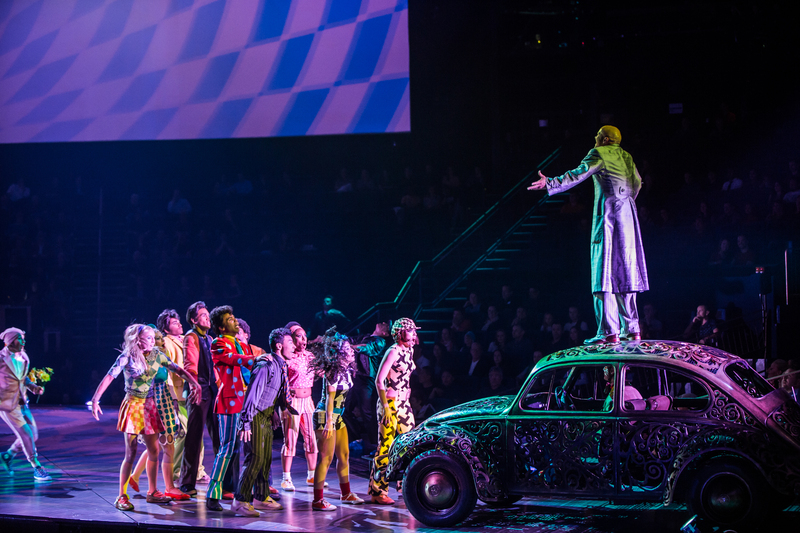 Then, as the massive cast came out to take a collective bow and circle the stage waving goodbye, the final song was the sunny “All You Need Is Love.” Considering it’s a lean 90-minute show, it’s amazing how much content is stacked up in The Beatles LOVE. It may not emanate from a straightforward narrative, but it is a masterful performance and visual spectacle. Millions have drawn joy and amusement from The Fab Four’s legendary catalog. Now, this is the definitive visual accompaniment, inspired by and using the best of the band’s material.